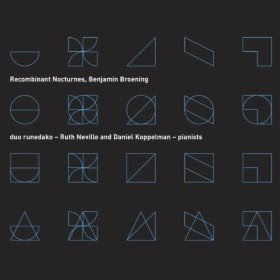 Benjamin Broening gives us in his work Recombinant Nocturnes (Innova 784) a long series of meditative, spacious, night reveries for two performers on one, two and four pianos and a subtle use of electronics. His music has something in common with mid-to-later Messiaen and George Crumb in its use of gently repeating, transforming, non-insistent motives surrounded by sustain-pedaled luminous darkness in expressive pianistic sound and cavernous pedal resonance. Duo Runedako performs the work with sensitive and dynamically brilliant execution. Ruth Neville and Daniel Koppelman work as one with results that charm the ear. There are 13 noctural emissions in all and they vary from the quietly mysterious, with quasi-Asian inside-the-piano dampening punctuations, to the dramatically powerful. This is the music of night magic, of exotically perfumed flowerings in unseen glades. It is music of beauty performed with sureness, with poetic conviction and gestural grace. This is well-worth having! It is music of special appeal.